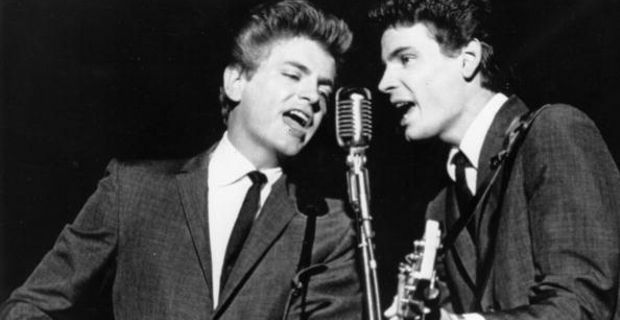 American musician Phil Everly, one half of revered country duo Everly Brothers died yesterday at the age of 74. According to his wife Patti, Everly died in the Los Angeles suburb of Burbank of complications from lung disease. Heartbroken Patty also told told the Los Angeles Times that the disease was the result of a lifetime of smoking. Phil Everly and his brother Don made up the Everly Brothers, a country pop duo which enjoyed a roaring success during the 1950s and early 1960s in the USA. Rolling Stone magazine dubbed them "the most important vocal duo in rock", and indeed they went on to become a big influence for bands such as the Beatles, the Beach Boys and Simon & Garfunkel. The duo's most famous hits include Wake Up Little Suzie, Cathy's Clown, Bye Bye Love, and All I Have To Do Is Dream. They toured with Buddy Holly during 1957 and 1958 and were inducted to the Rock and Roll Hall of Fame in the late 1980s and the Country Music Hall of Fame in 2001. The pair infamously broke up onstage in 1973, and the two brothers remained extranged for almost a decase. However, Phil later told Time magazine the their relationship had survived the musical duo break up. "Don and I are infamous for our split," he said, "but we're closer than most brothers." Phil Everly is survived by his wife Patty, his brother Don, their mother Margaret, sons Jason and Chris, and two granddaughters.